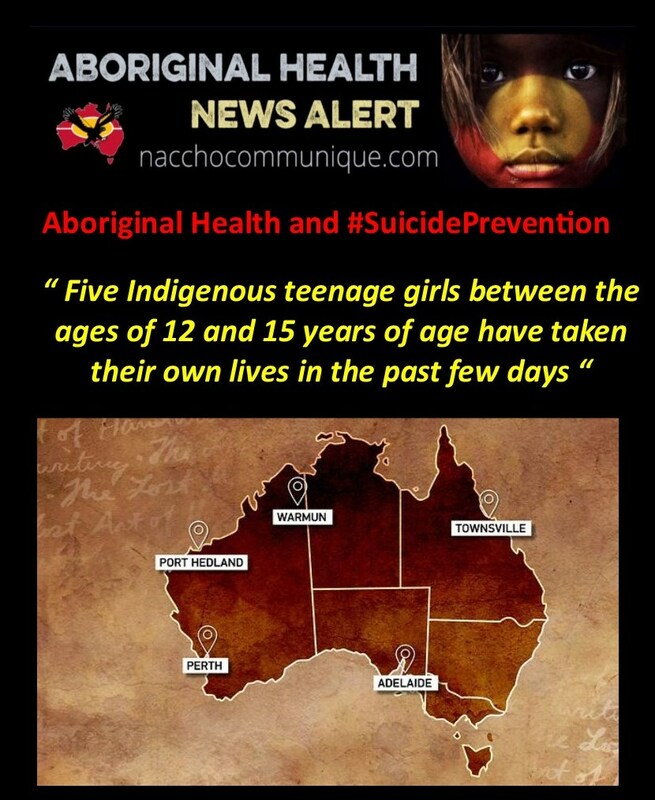 ” Five indigenous teenage girls between the ages of 12 and 15 years of age have taken their own lives in the past nine days. – Readers seeking support and information about suicide prevention contact: Lifeline on 13 11 14, the Suicide Call Back Service on 1300 659 467 or NACCHO find an Aboriginal Medical Service here. There are resources for young people at Headspace Yarn Safe. ” We have enormous amounts of funding injected into this critical area; yet, suicides continue to escalate. Our Indigenous youth are dying by suicide at EIGHT times the rate of non-Indigenous children and it is only right that we ask why this level of funding has had little to no impact. There are actually two tragedies here; the continued loss of the beautiful young lives through suicide, and secondly, that all efforts to fund an adequate response capable of applying the science of what prevents suicide have failed. 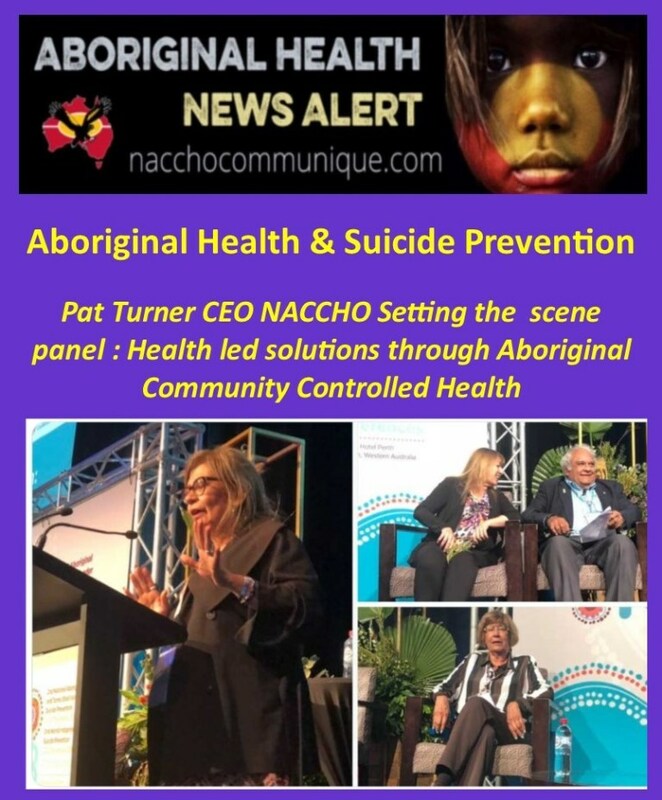 I am as concerned that the primary focus is on encouraging people to simply ‘talk’ about suicide without the clinical and cultural best practice programs and therapies available to respond to this awareness raising, particularly in our remote areas. Wasted opportunities for prevention are like an endless cycle in which money is thrown at band aid, crisis driven, reactive and ill-informed responses that disappear as fast as the latest headlines. Dr Tracy Westerman is a proud Njamal woman from the Pilbara region of Western Australia. She holds a Post Graduate Diploma in Psychology, a Master’s Degree in Clinical Psychology and Doctor of Philosophy (Clinical Psychology). ” When a Suicide occurs; we are constantly telling people to ‘speak up’ when they aren’t well – it’s very easy to say that to people, but when you are hurting mentally, you can’t speak up, you don’t tell people yr not well and you pretend everything is ok whilst slowly dying inside!! What’s stopping you from reaching in to help?? Don’t wait for people to speak up; start paying more attention to others; watch their behaviours, listen to how they respond. If every person in the world pays attention to those close; family, kids, relatives, friends, work colleagues, team mates – then every person will be able to notice when someone isn’t well. If we are not noticing, then I’m sorry, but we are not paying enough attention. We are losing too many lives, every statistic is a person – don’t wait for others to reach out; reach in and help them when they feel silenced and it’s too hard for them to talk!!! It starts with us – are we paying enough attention? Joe Williams : Although forging a successful professional sporting career, Joe battled the majority of his life with suicidal ideation and Bi Polar Disorder. After a suicide attempt in 2012, Joe felt his purpose was to help people who struggle with mental illness. Joe is also an author having contributed to the book Transformation; Turning Tragedy Into Triumph & his very own autobiography titled Defying The Enemy Within – available in the shop section of this site. In 2017 Joe was named as finalist in the National Indigenous Human Rights Awards for his work with suicide prevention and fighting for equality for Australia’s First Nations people and in 2018 Joe was conferred the highest honour of Australia’s most eminent Suicide Prevention organisation, Suicide Prevention Australia’s LiFE Award for his outstanding work in communities across Australia. “How can a child of 10 feel such ­despair that she would end her life? What must she have seen, heard and felt in such a short life to ­destroy all hope? What had she lived? How do her parents, her siblings, their communities live with the pain? How can they possibly endure the all-consuming grief of losing their child? Now imagine if this were your child, your family, your close-knit community. Wouldn’t there be outrage, a wailing from the heart of overwhelming grief? Part 2 : It is time to start demanding evidence of what works when we look at funded programs. Until we can get these answers, rates will continue to escalate. The Minister for Indigenous Affairs has recently shared that the Commonwealth Government has allocated $134M of funding into Indigenous suicide prevention. If you look at the current suicide statistics this crudely translates to $248,000 per suicide death annually – without adding State funding into the mix. We have enormous amounts of funding injected into this critical area; yet, suicides continue to escalate. Our Indigenous youth are dying by suicide at EIGHT times the rate of non-Indigenous children and it is only right that we ask why this level of funding has had little to no impact. I am not privy to how funding decisions are made and I have ZERO funding for my services, research or programs but the gaps are sadly too clear and have been for decades. As a country facing this growing tragedy, we still have no nationally accepted evidence-based programs across the spectrum of early intervention and prevention activities. This needs to be our first priority. Currently, and staggeringly, funding does not require that programs demonstrate a measurable reduction in suicide and mental health risk factors in the communities in which they are delivered. This needs to be our second priority. What this means is that we are not accumulating data or research evidence of ‘what works’. If we don’t evaluate programs and accumulate evidence, we have no hope of informing future practice to halt the intergenerational transmission of suicide risk. This needs to be a third priority. Additionally, we are the only Indigenous culture in the world that has a virtual absence of mental health prevalence data. Until we have a widely accepted methodology for the screening of early stages of mental ill health and suicide risk, early intervention will remain elusive; evidence based programs cannot be determined and treatment efficacy not able to be monitored. This needs to be our fourth priority. When suicide becomes entrenched, approaches need to be long term and sustainable. Report after report has pointed to the need for ‘evidence-based approaches’ but has anyone questioned why this continues to remain elusive? When you have spent your life’s work working in Indigenous suicide prevention and self funding evidence based research, as I have, I can also tell you that despite extensive training the complex and devastating issue of suicide prevention challenges you at every level. It challenges your core values about the right of people to choose death over life; it stretches you therapeutically despite your training in best practice; and it terrifies you that you have missed something long after you have left your at-risk client. The nature of suicide risk is that it changes. Being able to predict and monitor suicide risk takes years and years of clinical and cultural expertise and well-honed clinical insight and judgement. Throw culture into the mix and this becomes a rare set of skills held by few in this country. Indeed, a senate inquiry in December found that not only are services lacking in remote and rural areas of Australia, but culturally appropriate services were often not accessible. Funding decisions that are unsupported by clinical and cultural expertise in suicide prevention must be challenged and redirected in the best way possible. Toward the evidence. Instead we have inquiry after inquiry, consultation after consultation, statistics and mortality data quoted by media purely to satisfy the latest ‘click bait’ 24-hour news cycle headline. On top of that, there are continued calls from those who receive large amounts of funding that they need “more funding”. It is time to start demanding evidence of what works when we look at funded programs. Until we can get these answers, rates will continue to escalate. The time is now to make these changes and ask these questions. I am up for the challenge and have spent my life building and self-funding evidence of what can work to halt these tragic rates in Aboriginal communities and amongst our people. Will the decision makers join me in finding evidence-based ways to address this or continue to throw money at approaches and programs that are simply not working? Mr Georgatos said that services aren’t accessible to the majority of people living in the Kimberley, saying that suicide prevention has come down to community support as opposed to accessible mental health professionals. “Many of these communities [in the Kimberley region] have no services… It is forever community buy-in to support, to have a watchful eye …, but people become exhausted,” he said. Mr Georgatos said he believes investing in local workforces that possess local cultural knowledge and training these workers to understand intense psychosocial support for young adults is the way forward. Poverty and sexual abuse in the Kimberley region may be a leading factor for youth suicide, according to Mr Georgatos. “Nearly 100 per cent of First Nations suicides… are of people living below the poverty line,” he said. “Crushing poverty [in Kimberley and Pilbara] is the major driver of suicidal ideation, of distorted thinking, of unhappiness, of watching the world pass one by right from the beginning of life. A Medical Journal of Australia report in 2016 showed seven per cent of all people living in the Kimberley were homeless. Last year, forty per cent of youth suicides in Australia were Aboriginal and Torres Strait Islanders. “It is a humanitarian crisis… one-third of those suicides is identified as children of sexual abuse, and we don’t have the early intervention to disable the trauma of child sexual abuse,” Mr Georgatos said. Mr Georgatos said he believes if we have education in communities about what young children should do if they were to ever be predated upon, it would reduce the child internalising their trauma which may lead to suicidal ramifications. “What we need to do is we need to outreach more personal on the ground to outreach into these communities to support them into pathways where they can access education,” Mr Georgatos said. “We need more psychosocial support, people just to spread the love” – Gerry Georgatos. Australian youth mental health organization, headspace, last week received a $47 million funding boost from the federal government. Chief Executive Officer, Jason Trethowan, told SBS World News the organisation will be working closely with Indigenous communities thanks to the new funding. “We know there are challenges around rural remoteness and often headspace hasn’t been there for them… that’s why we have a trial going on in the Pilbara region of Western Australia where there are actually headspace services without a headspace centre,” he said. Indigenous health minister, Ken Wyatt, told NITV News the federal government will continue to invest $3.9 billion over the next three years (from 2018-22) in Primary Health Networks (PHNs) to commission regionally and culturally appropriate mental health and suicide prevention services, particularly in the Kimberley and the Pilbara regions. Currently the key active programs in these regions include the government’s $4 million Kimberley Suicide Prevention Trial and the $2.2 million Pilbara headspace trial, which opened in April last year. The Pilbara headspace trial was co-designed with local communities, including young people, service providers, community members and local Elders. The Pilbara headspace team has staff located in Newman, Port Hedland and Karratha, with employees spending their time in schools, youth centres, Aboriginal Medical Services, community centres and other locations. This allowing them to reach out to youth who may not typically engage with school or youth services, said Samara Clark, manager of headspace, Pilbara. “It’s all about engagement first, building trust, building visibility,” she said. “What we’re hoping for is positive help-seeking behaviour, where they feel safe and comfortable enough to come up to us,” she said. Ms Clark encourages anyone who sees a headspace worker, who may be identified by their green t-shirts, to reach out to them for support. – Readers seeking support and information about suicide prevention can contact: Lifeline on 13 11 14, the Suicide Call Back Service on 1300 659 467 or find an Aboriginal Medical Service here. How can a child of 10 feel such ­despair that she would end her life? What must she have seen, heard and felt in such a short life to ­destroy all hope? What had she lived? How do her parents, her siblings, their communities live with the pain? How can they possibly endure the all-consuming grief of losing their child? This is what is happening to ­indigenous children and young people in our country. And to parents and communities as our young people are dragged into a vortex of suicide by despair. 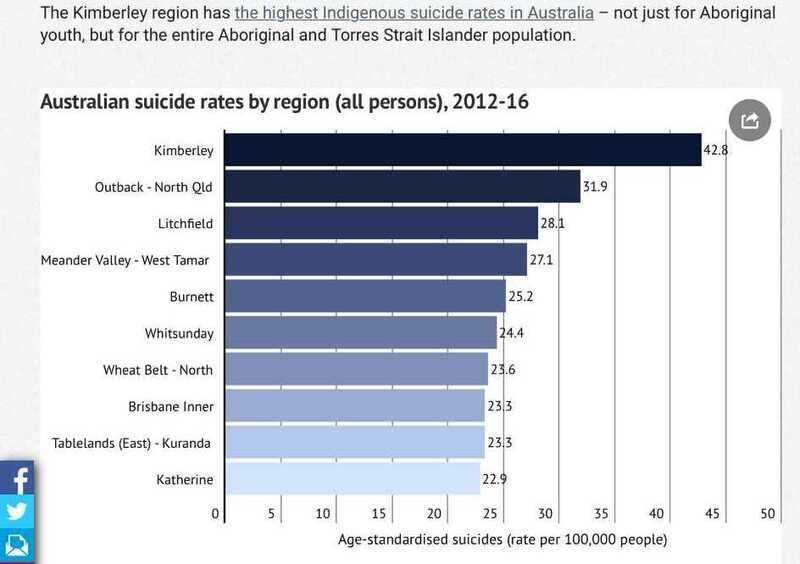 In a week, five Aboriginal girls have taken their own lives — prompting a warning from one ­researcher that indigenous children and young people could soon comprise half of all youth suicides. Researcher Gerry Georgatos says poverty is a major issue in suicide among young indigenous Australians, but also that sexual predation is a factor in a third of cases. My heart breaks for these girls and their families and their unimaginable pain. The organisation that I lead, Culture is Life, wants our country to treat this as the national emergency it is. We want every Australian to think about the devastating toll of indigenous youth suicide and to help us to stop it. Urgently. Instead of expecting youth suicide, we must take a stand of ­defiance against it. Unfortunately, across Australia, suicide and self-harm are on the increase. This is being driven by a deep sense of hopelessness and despair, by a lack of belonging and connection, and in some cases by the abuse young people have experienced. Indigenous young people today are living with the consequences of acts committed by other human beings in charge of policies and laws through more than two centuries of trauma and dispossession. This history haunts us. It lives within us. It’s there in our families’ experiences of stolen land, children and wages, of killings and cruelty and abuses of power. They see this history in their grandparents’ eyes, if they are still alive. They discover it in their family stories of exclusion and unfairness. And when they, too, feel the slap and sting of racism and ignorance when it comes at them as abuse in the schoolyard, or they sense the awkwardness of others in understanding their Aboriginality, or someone’s eyes won’t meet theirs, this history becomes the present. It eats away at them — at their confidence, their self-belief and their self-love — every time they are the target of racism and discrimination or at the end of ignorance and apathy, and when they are directly affected by abuse. The task of repair and healing requires a powerful counterforce to all that. We can tackle this together. We can begin to repair these wounds through daily acts of love and hope in communities, schools, universities and workplaces. Daily acts that send a message to our young people that there is belonging, strength and pride in indigenous peoples and cultures. We are asking all Australians to show our young people that there is cause for love and hope. Show them that you share a deep sense of pride in who they are, in our inspiring cultures and in our strength. Tell them they matter, by showing your pride in Aboriginal and Torres Strait Islander cultures. Share it with #loveandhope and #cultureislife. Because when our children have love and hope in their lives, it combats helplessness and reduces the risk of self-harm. It gives them the support and courage required to take the steps they need and want to take. And when the broader community shows our kids that they care, it deepens our connections as Australians. One of the things I love most about my people is our willingness to invite ­others to connect with us and to experience our culture. And the only reciprocal ask is to take up the invitation to connect. Once you take up the invitation, you will be an ally in rectifying some of the most haunting statistics for our country. We know from the research, and from psychologists who work with young indigenous people, that such small gestures of affirmation can make a powerful difference to their safety. Tanja Hirvonen, an Aboriginal psychologist, says many people don’t know the power of “warm interactions and warm gestures” at just the right moment to avert disaster. Culture and connection are powerful protective factors against indigenous youth suicide. That’s why the work of Aboriginal leaders across the country in ­cultural pride, revitalisation and renewal programs is so crucial. People such as Yuin elder Uncle Max Harrison, who is teaching young men the ways of the old people, their lore, their duties, their responsibilities. And, as he does so, he is building their pride, strength and resilience. So that they walk taller, knowing who they are, that they are cared for and supported and connected to this land. It’s a model for us all to feel more connected as Australians. We cannot fail to act when we are able to save children and young people from the agony and hopelessness and torment that leads to suicide. We can affirm them in who they are, and in so doing, we can save lives. Belinda Duarte, a Wotjobaluk woman, is chief executive of Culture is Life. 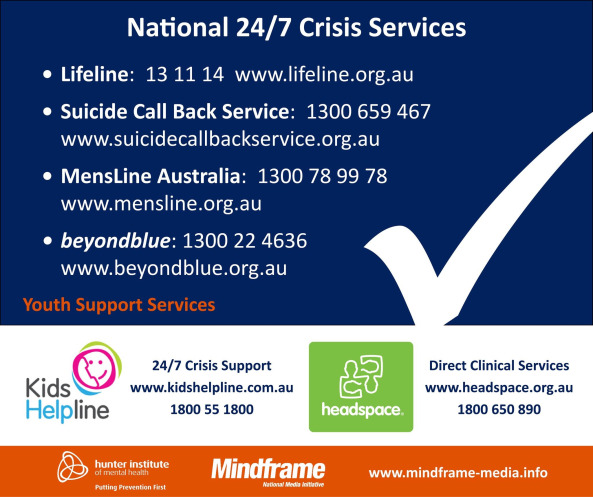 For help: Lifeline 13 11 14, Beyondblue 1300 22 4636.